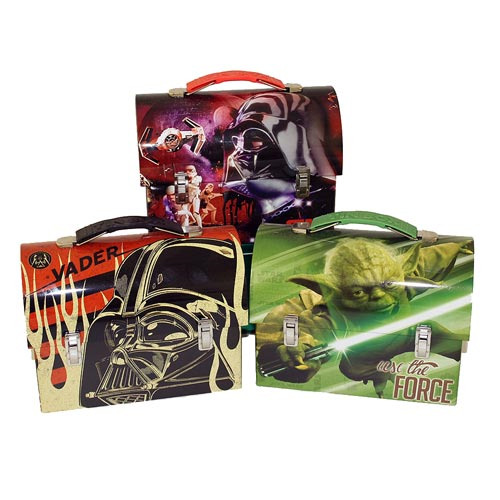 The Force will be strong with you no matter which of these 6 7/8-inch long x 5 3/8-inch tall x 3 1/2-inch wide workman-styled lunch boxes you choose for your lunch today. It merely depends on whether you're leaning toward the light or the dark side at the moment. The Star Wars Large Workman Carry All Tin Tote Lunch Box Set brings you 3 metal totes in 3 distinct designs inspired by Star Wars. The first design presents The Dark Lord of the Sith with a cast of Stormtroopers, a TIE fighter, and more. Next comes Jedi Master Yoda with his lightsaber, beckoning you to "Use the Force." Finally, Darth Vader's ominous helmeted visage commands attention on a red, white, and black lunch box. You get all 3!